Seeds of female Ginkgo trees tend to "smell" when fallen on the ground, not while they are still on the tree. This can be a problem in crowded places. 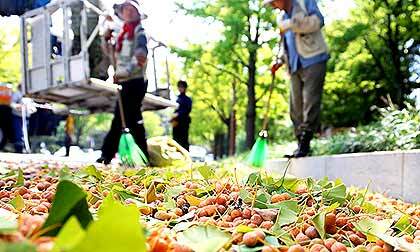 1. a large team of 446 people collects them, then the seeds are used in cooking, medicine. The metropolitan government is also planning to hand them out or donate them to senior citizens at community halls and welfare centers in Seoul. 2. transplant female trees and replace them with male Ginkgo trees in crowded places like bus stops and crosswalks. The Ginkgo is the symbol tree of Seoul. Article in the Korea JoongAng Daily of October 12, 2015. Read my website about the seeds: Propagation-page and FAQ.